The Rachel Barton Pine Foundation was born out of Rachel’s passion for sharing classical music, as well as some of the challenges she faced as a young musician. As a child, Rachel dreamed of becoming a concert violinist, but growing up in a financially struggling household, she faced many hardships. Her father was frequently unemployed. Their phone and electricity were often shut off. Many times, they were one missed payment away from losing their home. To accommodate Rachel’s 8-hour-a-day practice regimen, her mother educated her at home and was thus unable to go back to work as she had planned. 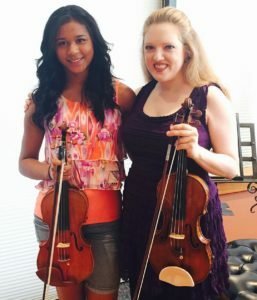 Scholarships allowed Rachel to continue violin lessons, but they didn’t cover out-of-pocket expenses like the cost of sheet music, accompanist fees, new hair for her bow, new strings for her violin, concert clothes, audition recording sessions, and the like. 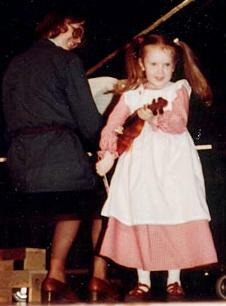 As her playing became more advanced, she also needed an instrument of higher quality than her family could afford. Thankfully, various friends, extended family, and arts patrons helped her at critical junctures. Inspired by those early struggles, and with a desire to pay forward the generosity that allowed her to realize her dream, Rachel formed the Rachel Barton Pine (RBP) Foundation in 2001. Its initial programs, which continue today, are designed to support and encourage talented young string players from challenging financial backgrounds who want to become professionals. The Grants for Education and Career program helps with the many expenses not covered by traditional scholarships. The Instrument Loan Program allows deserving players to benefit from high-quality instruments that otherwise would not be available to them. Thus far, these two programs have helped more than 80 young artists. 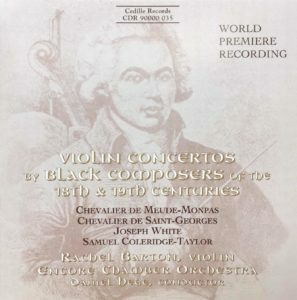 In 1997, Rachel released a groundbreaking recording, Violin Concertos by Black Composers of the 18th and 19th Centuries (Cedille Records). The overwhelming response to this album by students, parents, and teachers led to her joining the ranks of those who work as advocates for diversity in classical music. Combining her passions for inclusion, music education, and music research, the RBP Foundation is developing a curricular series, Music by Black Composers (MBC), in collaboration with the University of Michigan. MBC will acquaint students of all backgrounds and various stages of development with the rich heritage of classical music by composers of African descent. The RBP Foundation’s Global HeartStrings program supports aspiring classical musicians in developing countries who cannot obtain basic supplies such as rosin, strings, reeds, and sheet music. Thanks to many energetic volunteers and generous manufacturers and retailers, the RBP Foundation continuously gathers materials to send to countries such as Haiti, Ghana, and Nigeria. In 2010, Global HeartStrings was also able to help replace instruments broken in a devastating earthquake in Chile. The RBP Foundation is a 501 (c) 3, and so it relies on tax deductible contributions from individuals, corporations, and foundations as a way to support its mission and programs.